Whisk together the vinegar and sugar until sugar is dissolved. Pour half of the vinegar into a microwave safe bowl and microwave 1 minute. Add onion, toss to combine and let sit 30 minutes. While onions marinade, toast the poppy seeds in a non-stick skillet until fragrant and darkened. Whisk oil into remaining vinegar mixture. Add FRESH ground salt and pepper, to taste. 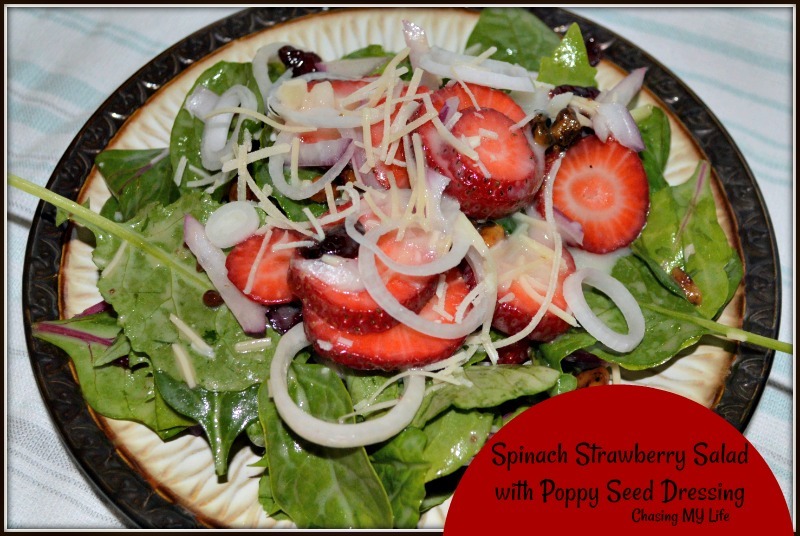 In a large salad bowl combine spinach leaves, romaine pieces, strawberry pieces and candied walnuts. Remove onion from vinegar mixture and add to salad bowl, gently tossing to disperse. Whisk onion marinade back into the vinegar mixture. Plate salad and top with more walnuts if desired.